There's no better way to get to know a country than by taking part in its festivals. Check out our yearly round-up of Germany’s best festivals and events that will give you a taste of German culture, tradition, and art at its best. Carnival is also called the “Fifth Season” in Germany; alongside with many colorful costume balls, the highlight of this festival is the Rose Monday Parade with marching bands, dancers, and decorated floats parading down the streets across Germany. Carnival is celebrated throughout the country but centered in Cologne, Düsseldorf, Muenster, and Mainz. Every February, Berlin rolls out the red carpet to host the Berlin International Film Festival. What to expect? More than 400 films from all over the world, parties, historic theatres and special events open to everyone who loves film. Besides Cannes and Venice, Berlinale is the most important film festival in Europe. This festival invites you to see the Rhine's natural beauty in a whole new light. Thousands of Bengal lights, stunning fireworks, and illuminated steamboats that glide down the Rhine, bathing the river banks, vineyards, and castles in a magical glow. The spectacle takes place on weekends throughout May and September. Erster Mai or Labor Day or Tag der Arbeit has become quite the event. In Berlin, May Day is an annual throw-down between left-leaning protesters (and thinly veiled troublemakers) and ​Polizei. In an effort to turn the annual riots into something positive, the city has worked hard to create a festival environment for My Fest. About 16 city blocks in Kreuzberg are shut down to traffic and turned over to live bands and neighbors slinging a variety of delicacies on the street. In Bavaria, May Day is still a drunken affair but generally much more positive. In Germany’s picturesque south, the villages of Bavaria do indeed erect a flowery Maypole (Maibaum) to welcome warmer weather (Frühling). Berlin celebrates its own unique carnival in summer, the colorful Carnival of Cultures - more than 1,5 million visitors pay tribute to the multicultural spirit of Germany’s capital with this four-day street festival. Enjoy exotic food and drinks, concerts, parties, and a carnival parade with decorated floats, singers, and dancers from over 70 different countries. This world-class music festival in Leipzig commemorates the life and work of the city's most famous resident, Johann Sebastian Bach. Renowned artists from all over the world perform Bach's classical masterpieces in historical venues like the Thomaskirche (Thomas Church), where Bach worked as a cantor for 27 years. 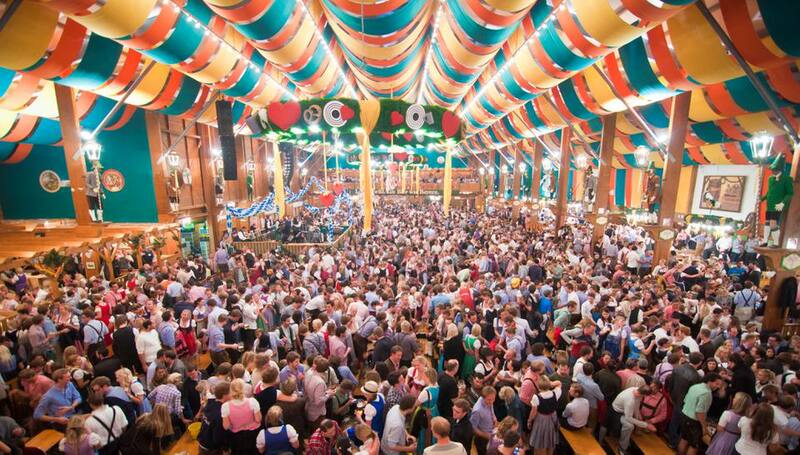 The highlight of our German festival calendar: Oktoberfest in Bavaria. Every September and October, over 6 million visitors from around the world come to Munich to celebrate Bavarian cuisine, music, and traditions. There are are many colorful parades, open-air concerts, and fun rides to enjoy for the whole family. Although this fair is officially called "Wurstmarkt" (sausage market), it is famous for its celebration of excellent local wines. Located in Rhineland Palatinate, Germany's second largest wine growing region, the Wurstmarkt prides itself in being the world's biggest wine festival. This culinary event has been celebrated every September for almost 600 years. Just outside of Stuttgart every fall, the largest pumpkin festival in the world takes place. On the grounds of the spectacular Schloss Ludwigsburg, over 450,000 pumpkins are on display. Look for unbelievable pumpkin displays, events like the pumpkin boat race and all food things pumpkin. Grey Berlin is uplifted by October's Festival of Lights. Walk among the city's finest sights lit in a rainbow of color. Christmas markets are a wonderful part of the German holiday tradition and a great way to get into the Christmas spirit. Every German city celebrates the season with at least one traditional Christmas market; enjoy old-fashioned carousels, buy handmade holiday decoration, listen to German Christmas carols, and sample homemade Christmas treats.